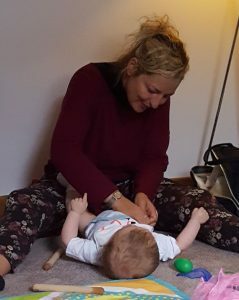 “Story Massage for babies is fun and interactive” says Sally Hudson, a Story Massage Instructor who has developed a five week block of ‘Story Massage, Movement and Song’ classes as a follow-on from her Baby Massage and Yoga classes. 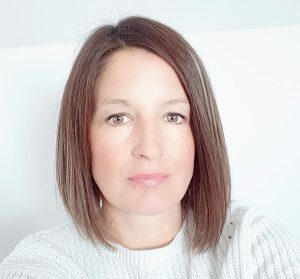 Sally, founder of Little Miracle Massage in Angus, was recently presented with our Best Practice Award for her enthusiasm and commitment to helping parents share the benefits of positive touch as their children grow from baby to child to teen. We asked Sally some questions about her work. What happens in a ‘Story Massage, Movement and Song’ class? Classes are held in the morning, from 10.00 to 11.15. 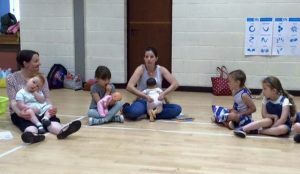 The babies attending are over the age of 5-6 months as there is a lot of interaction, lap bouncing and movement in my classes. There is a different theme each week such as Animals, Seaside Fun, Weather, Traditional Nursery Rhymes and Tapping Sticks. Each class has a set structure as babies respond so well to repetition. We always start with our Hello Song. We sing it to each baby while their Mums are massaging them, and they love this. The babies seem to get very excited because they know what is coming next…. we do some stretching and then we begin the themed Story Massage session. We finish each week with massage to our Goodbye Song. 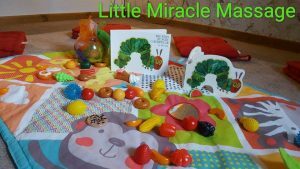 What is Story Massage for Babies? 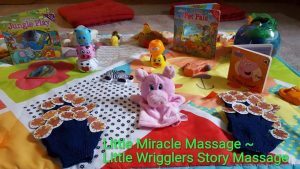 Story Massage for babies is done fully clothed and no oil is used. Parents learn ten simple massage strokes which are used to describe words. For example, parents might use a big circular massage movement to illustrate the sun is shining, or a walking massage movement to illustrate a bear. Once these basic strokes are learnt, they can be used to share positive touch through a whole variety of stories, rhymes and songs. Each week, we sing songs on the theme and use the different massage strokes as we sing together. 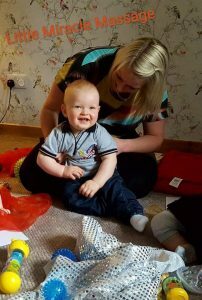 We repeat each song about 2-3 times as this give the Mums the opportunity to memorise the words and the strokes, and the repetition encourages relaxation and language development for the babies. We also includes a short story on the theme of the week. I read this aloud while the Mums massage their babies and it encourages everyone to listen and relax. We use props relating to the class theme. And there are always sensory props available such as scarves, feathers, textured balls and soft brushes which give a variation to touch other than Mum’s hands. Babies enjoy the feathery sensation or the tickle of a scarf on their body. What are the benefits of Story Massage for babies? Story Massage allows parents to continue to offer nurturing massage as the child grows. It is a life-long skill that they can use for many years. Repetition of songs and stories encourages anticipation, development of language skills, focus and concentration, communication, turn taking and socialising skills. Research (taken from The Touch Institute, Miami) has proven that children who learn healthy views of touch and are provided with tactile experience by a parent or carers are more likely to grow up with a healthy self image, a sense of appropriate boundaries and long lasting intimate relationships. 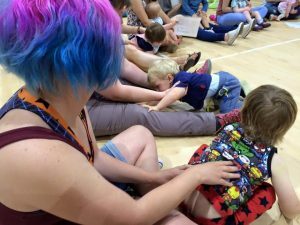 Story Massage offers parents the opportunity to connect and relax with their baby through the medium of story telling, singing and loving touch. This helps build upon their existing parent/child bond. How did you train in Story Massage? I chose to take the Story Massage Online Course because attending a course can often be quite difficult when you have a lot of demands to juggle. I am already a practising Massage in School Programme (MISP) Instructor so it was easy for me to complete it quite quickly. 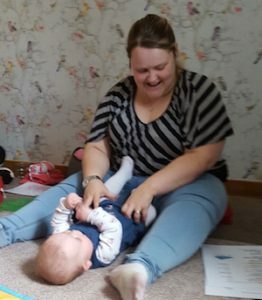 I chose to do the training so that I could use Story Massage in a school setting within my regular groups, and also as a follow on from Baby Massage classes. I can see endless opportunities for Story Massage as a 1-2-1 activity and in classes and groups for children of all ages and abilities. You can find all the details of our training options here: Story Massage Training.